Aristo cars currently come equipped with plastic wheels. I've changed all mine to metal wheels and there are a couple of complications. Typical metal wheels are slightly smaller in diameter than the stock wheels so that the bottoms of the brake shoes tend to drag on or near the track. If a brake shoe catches on anything, it'll rotate and the truck springs will pop out and launch into never-never land. See the next section for information on replacing truck springs. As can be seen in the photo, I clip off the bottom 1/16" of the brake shoes. Since I've done that, I've never lost a truck spring. On some cars, the trucks are mounted too tightly and the cars tend to derail on uneven track. Flip the car over and try to rock the truck side to side. If it won't rock a little, loosen the mounting screw until it does. Aristo uses sprung trucks on all their rolling stock. The advantage is that the trucks are compliant and will rock to follow uneven track better than trucks with solid side frames. The dark side of the sprung trucks is that the springs can pop out. They will also rust away if left out in the weather. Some people have claimed that ball point pen springs will substitute for the stock springs. I just bought a bag of replacement springs and use them. They were pretty cheap. Paul Norton wrote to say that the springs provided with the hook and loop couplers that come with every car also use the same spring, so there are spares in every box. The first thing you ought to do when you try to replace the springs is to trim the brake shoes so that it won't happen again. I've found that a Kadee five finger grabber tool is just right for holding a spring. I grab the first couple of turns at one end and then use an Xacto knife blade to compress the spring as it is reinserted. I can usually get a spring back in on one try. Some people put a drop of CA on one end of the spring to hold it in place but I've found that with the trimmed brake shoes it is unnecessary to glue the springs. Kadee #831 coupler boxes can be easily modified to mount on Aristo cars in such as way that the car to car spacing is at least close to prototypical. The only way to get the cars closer is to body mount the couplers. I use a Dremel cutter tool to grind off the back part of the coupler box so that it will tuck under the axle. 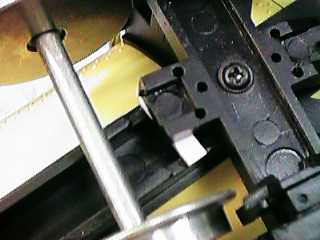 Then the coupler can be mounted with the Kadee supplied screws in the existing hole. 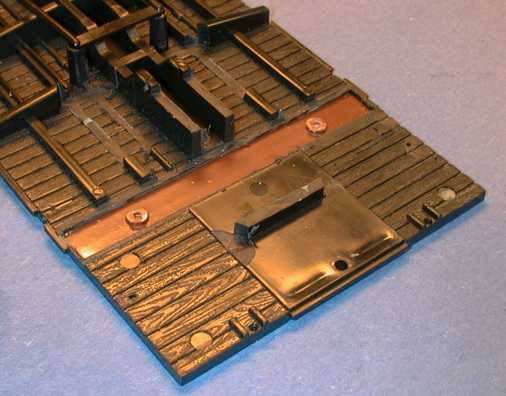 If you've used metal wheels, you may need to use one of the black Kadee supplied shims under the back part of the coupler body to cant the coupler upward to the right height. It is very important that the coupler be mounted at the right height AND that the coupler stay at that height under the dynamic loads that it sees while being pulled in a heavy train. Due to the coupler truck mounting geometry, the couplers tend to dip downward when being pulled. This can cause the trip pin to catch on turnouts or uncoupler magnets, or even cause the coupler to slip under its mate and separate. 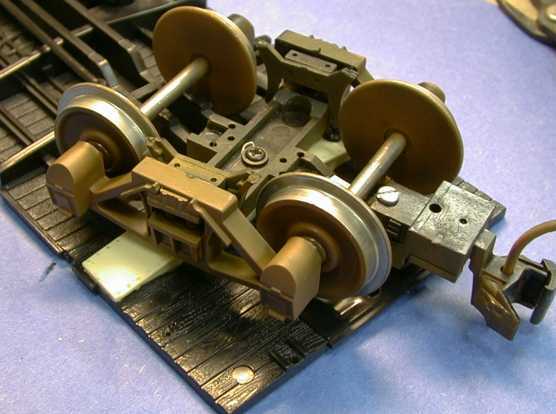 The trucks on some Aristo cars allow the coupler to move up and down over a fairly wide range. 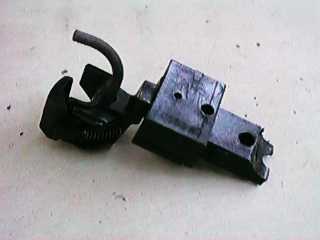 On some cars, you may have to add a shim like the one shown in the photo to prevent the coupler from dipping down. 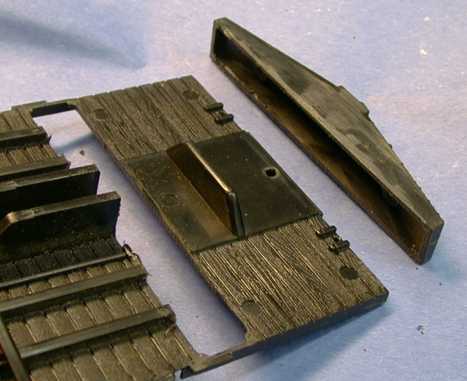 This piece of 0.080" styrene was glued to the frame of a troublesome Aristo single dome tank car to limit the coupler movement. When the truck is installed, the extension on the back part of the truck will hit this shim and prevent the coupler from dipping too far. 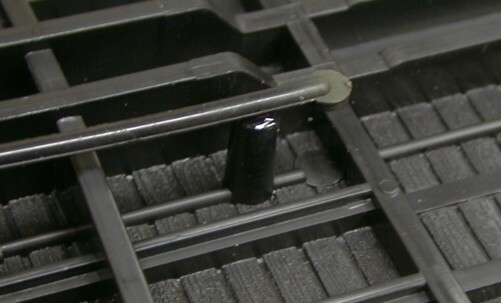 You can adjust the shim thickness so that very little vertical slop exists when the truck mounting screw is loosened to allow the truck to rock from side to side. 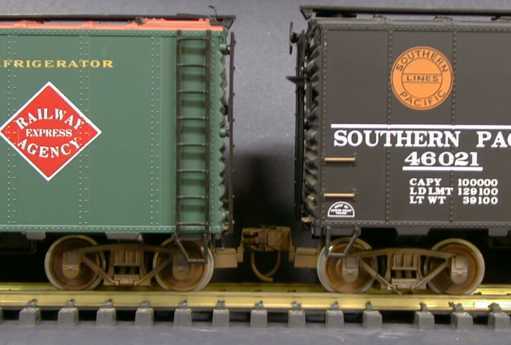 Aristo box cars, stock cars and reefers will require a thicker shim. On some cars, such as the hoppers, there is nowhere to mount this movement stop. If a hopper needs this modification, then you have to build up a pedestal behind the truck. 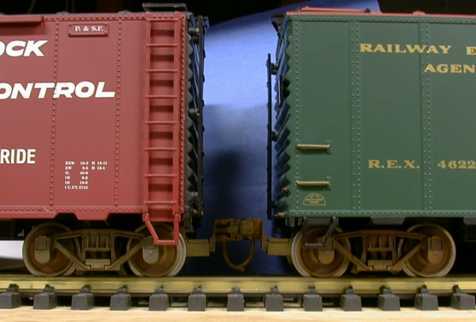 The Aristo Long Steel Caboose is a fairly well detailed model but it has one serious problem. The power pickups on two axles tend to get really noisy. 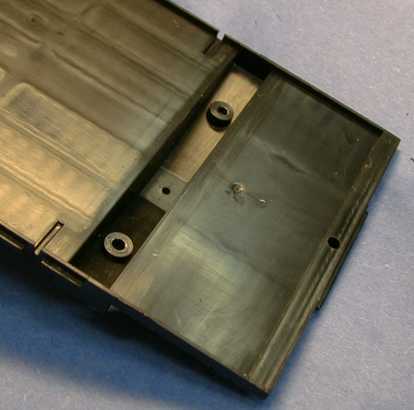 The stock contacts are bullet nosed steel pins that bear against the wheel backs. Fortunately, there are two fixes for this problem. Aristo is now shipping a carbon brush that can replace the steel contacts. To replace them, remove a contact assembly, remove the steel contacts, insert a carbon contact and replace the contact assembly. LGB contacts can also be used replace the whole contact assembly but it is a little more complicated. Remove the contact assembly and pull up as much wire as you can. Then pull the brass contact holder out of the pocket and unsolder the wire. Resolder the wire to the end of an LGB contact and press the contact back in the holder. Pull the wire back down through the truck as you are reinstalling the contact assembly. Either of these fixes will materially reduce the contact noise that the caboose used to have. Aristo Craft has posted exploded diagrams of some of their rolling stock at Exploded Diagrams. Not all the cars are there yet, but Aristo is adding them to their site as they find time. The diagrams are stored as .PDF files so that you need Adobe Acrobat Reader to read them. There is also a link on the exploded diagrams page to get a free copy of Acrobat Reader. These diagrams are extremely useful and I would recommend that you download the diagram, print a hard copy and study it before you take your cars apart for the first time. 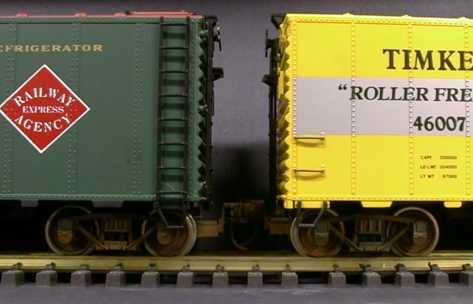 AristoCraft rolling stock is generally pretty close to scale, except for the height of the box, stock and refrigerator cars. There is too much space between the carbody and the trucks. This was probably done to allow the trucks to rotate enough to follow tight radius curves. 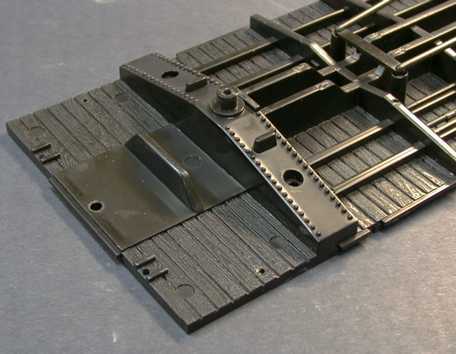 However, it is possible, with some non-trivial work, to lower the cars to a more prototypical height and STILL allow the car to run on tight radius track. The car can be lowered by 3/16", any more and the stock wheel flanges will interfere with the car floor. Since I was using smaller San-Val metal wheels, I lowered this car a little more, actually by a full 1/4". The method that I describe here is not my invention. I am illustrating the method first described by Larry Cooper in an article posted on Large Scale Central. 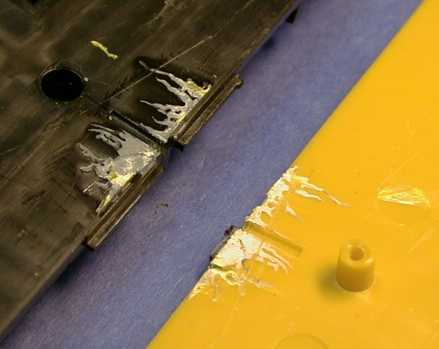 Larry's method involves grinding out the original bolster, which is molded into the floor of the car, and replacing it with another smaller one. Larry made his own pattern for the new part and replicated it by molding copies in resin. He was kind enough to send me a few and I made my own mold so I could make more. I have finished the conversion of the first car, an AristoCraft REA reefer. Now only 13 cars to go. This is the bolster of an unmodified car. The whole bolster needs to come out, not a particularly easy job unless you have access to an end mill. The entire car must be disassembled to allow the floor to be worked over. First remove the trucks and set them aside. There are six very long screws that hold the floor to bosses up near the roof, two on each side and one at each end. Remove all of them. There are two small screws on the side of the car directly behind (or on reefers beneath) each door, remove them. If the car is a reefer, also pull out the brass wire step. Then pull out all four steps at the car corners. Then pull off the body of the car. The four screws in the bolsters have to come out as that area will be milled through. There are two more screws near the center of the floor, these can be left in place. I milled the bolster completely away flush with the wood detail on the car floor to get the maximum height reduction. Larry recommended that 1/16" of the bolster be left behind to get a 3/16" height reduction. I milled the two screw bosses down to the same level because the new bolster is flat on the back to make it easy to cast. Larry mills pockets in the backs of his bolsters and retains more of the posts. I found it easiest to clamp the floor down to the mill index table with 4 dogs. Milling in a vice won't work well as the floor will bow. Also note that there might be three small mold marks on the floor that will lift the center of the floor. These need to be filed off or arranged to project into the slots in the index table. 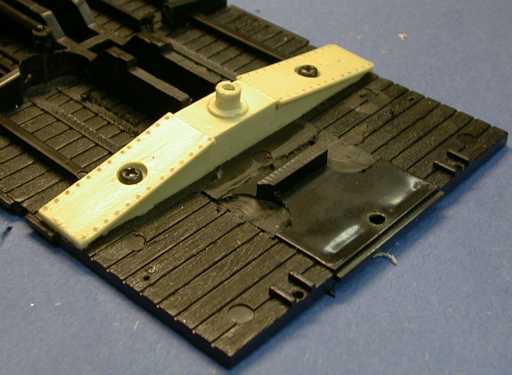 The ridge near the car end must be milled down to by whatever height reduction that you use to clear the stock coupler or a Kadee coupler. It also must be narrowed a little to clear the wheels at the extremes of truck rotation. Since my truck mounted couplers are mounted to the unmodified trucks, their height is unchanged. If you use body mounts, you will also have to adjust the coupler height. The center sill behind the bolster must be milled to the height of the bearing ring on the truck bolster to clear the tang on the rear of the truck. This allows the truck tang to ride right on the sill to prevent the truck from tipping when pulled in a train. Some of the floor detail must be milled down to the wood grain to clear the flanges of the wheels. The San-Val metal wheels barely clear the floor. If larger wheels are used, the car can't be lowered a full 1/4". The first cross beam must be milled out some to clear the flanges at the maximum truck rotation to allow the car to pass tight radius turns. The new bolster is screwed back down to the shorter bosses with the original screws. The screws will almost penetrate the car floor, leaving just a little mark in the inside of the car. I also put a glob of epoxy putty under the bolster. There isn't much of the original frame left at the sides and most of the strength that is left comes from the floor so that it needs to be securely attached to the bolster. The stock Aristo bolster has two ridges on it to control rocking of the carbody. Larry's cast bolster doesn't have those features and doesn't need them. The slope of the bolster is different so that the sideframes almost ride on the bolster so that the modified car actually rocks less. The original truck is screwed back in place with the original screw. The truck should be fit checked to make sure that it is level and doesn't bind during rotation. If it binds against the bolster at all, the inside upper edge of the truck sideframes can be filed just a little. At this point the bolster should be painted black and the car can be reassembled. Getting those long screws back in is easier than it looks. The side screws can be seen through the car doors to allow them to be guided back into their bosses. 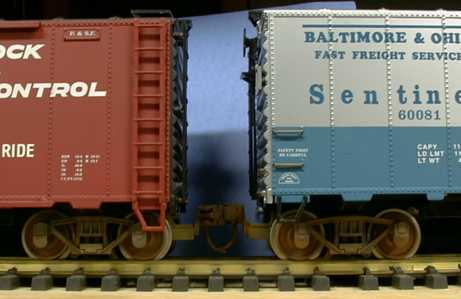 On stock cars and box cars, the end screws can be seen through the side doors. 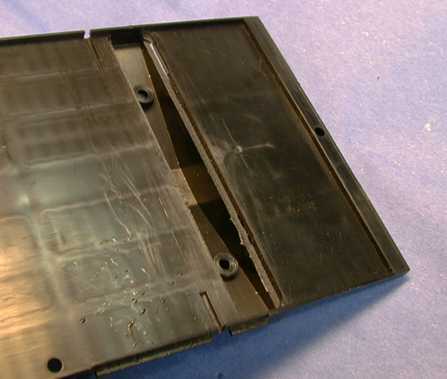 On reefers, the end screws can be seen through an ice hatch. Overall, the effect is quite good. Lowering the car does have a significant visual impact. Paul Burch wrote and commented that he had been lowering cars for several years by a somewhat different method. He separates the car interior floor from the frame and then cuts the original bolster out from the back. The original bolster is then ground down to height and glued back on after the screw bosses are ground down. Even though Larry's method using a replacement bolster works out very well, not everybody has replacement bolsters. I elected to try Paul's method too. This time, I tried to hit the 3/16" height reduction more closely. I had considered this approach before but didn't pursue it because on the car that I first looked at, the floor seemed to be securely glued into the frame and it looked like I would destroy one or both pieces trying to get them apart. On this Timkin Roller Bearing car (an REA vintage car) the floor was glued only at the middle where the little screws from the side comes through. I would expect that every car is glued at least here or the screw will have nothing to bite into. A sharp knife should be used to cut through the glue between the floor and the lip around the frame in this region. Then the floor at the end of the car can be peeled up a little and a long screwdriver can be inserted to the point of the glue joint and gently twisted to break the remainder of the glue joint. You'll have to do this from all four corners. On this car the floor broke away cleanly. The topside of the cars shows the inside corner on the long sides of the bolster that need to be milled or filed off. After milling 0.080" in width and 0.080" in depth, the corner of the milled edge just breaks through to the other side at the ends of the bolster. 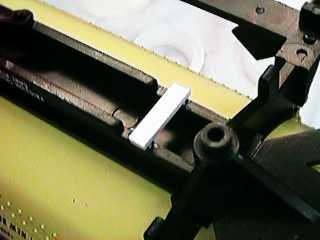 After milling, a razor saw can be used to cut vertically to finish the separation of the long sides of the bolster and the frame. On the side with the center sill, the razor saw is used to cut the sill parallel to the bolster right down to the level of the floor and then the saw is used to cut through the remaining plastic on the second long side. The ends of the bolster are cut with a razor saw horizontally from the ends parallel and next to the wood floor. When the final cut is made, the bolster will fall off. The bolster then needs to be shortened so that it will fit back into the hole left behind. Cut the end off just outside the first set of rivets with a razor saw an then file the ends to fit back up into the hole. When the bolster is fitted back into the hole, it will be at the right height when the end of the bolster is level with floor. The original height of the bearing surface of the bolster (the ring around the pin) is 0.600" measured from the ring to the smooth plastic area near the center of the bolster. When reinstalled it should be 0.187" shorter, or 0.413" from that same surface. I reattached it with a few drops of Zap-CA to hold it in place while an epoxy fillet cured. The back of the bolster sticks above the upper surface of the frame and was milled off flush. After reinstallation of the floor, the center sill and underbody details were milled as in the previous modification. This is the two lowered cars together. The extra 1/16" really doesn't show much, both cars look far better than the stock height. Which way is better? It depends. Paul's method is clearly more work, requiring multiple setups on the mill and more machining. I spent roughly twice as long doing it Paul's way, but then again, my machining skills are minimal at best. However, if you don't happen to have a cast replacement bolster, then Paul's method is a practical way to do it. The easiest way to lower the Aristo Freight cars is to buy a new floor from Aristo. 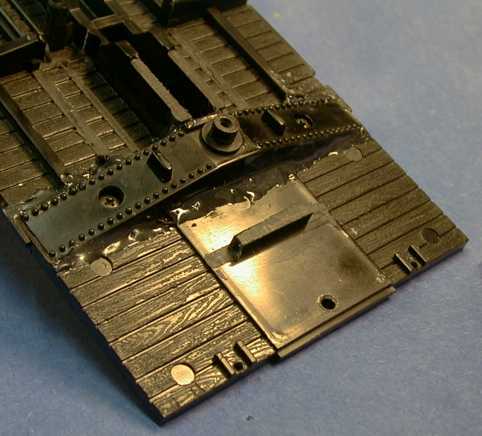 Part number ART-29706 is a replacement floor for cars in the 41000, 41100, 46000, 46100, 46200, 46300, and 46400 series freight cars. Lewis Polk took some of the bolsters that I made from Larry's pattern back to his engineers and they came up with this new floor assembly. The bolster is lowered by 0.175", not quite as much as can be done by gouging out the original bolster and replacing it, but enough to make a significant visual difference. Remove 6 long screws from around the car edge. These are in the floor, but engage threads in the roof. There is one at each end and two along each wall. Open the car doors and remove a small screw under the center of each door. On reefers, also remove the small brass wire step. There are six screws underneath the frame, two near the center and two in each bolster. Remove them too. Nothing will come off, but you'll need the screws later. Remove the floor. The floor may hang on the ends of the corner step pins. It might be necessary to pull the steps out slightly to free the floor. On the original sample of the new floor assembly that I got, the floor insert and the frame piece are separate parts. 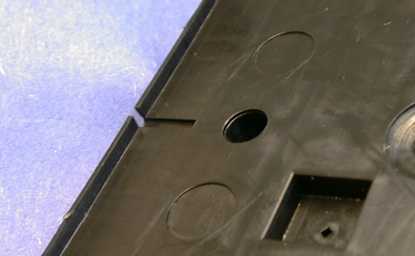 The small screws that were below doors actually engage between the car floor and the frame in the slot shown in the photo. The two screws there were in the frame at the center pinch the frame and the floor together, but don't do it well enough to prevent the side screws from splitting the floor and the frame apart. Apply some CA (Superglue) to the frame on both sides of the slot and slap the floor and frame together and drive in the two screws to hold the parts together while the glue sets. Then just reassemble the car in the reverse order. The air tank underneath goes on the end with the brake wheel. You'll need to look into the doors to guide the long screws back in place. After a while, I ordered a bunch of new floors, these were different. The floor parts came already glued, but WITHOUT the six screws that hold the inner floor to the frame. Also, the new parts came WITHOUT brake rigging so those parts must be removed from the old floor. Depending on how the original car was assembled, it may necessary to break the mounting pins off the old brake rigging to get them off the old floor. The old part can then be attached to the new floor with a gap filling adhesive such as Zap-A-Gap CA. Also depending on your car vintage, the old brake rigging may not fit on the new standoffs. Apparently, somewhere back in the production, Aristo moved the standoff for one end of the rigging about half an inch as shown in this photo. The old location for the standoff can be seen as a mold patch mark. This change in the brake rigging post was probably done to relieve an interference problem with a wheel flange. With a stock Aristo plastic wheel and the end of the brake rigging in the original position, the flange will just miss the brake rigging in tight turns with the original floor. However, when the car is lowered, the interference will exist. The simple solution is to clip the end of the old brake rigging off. Since I have all metal wheels (San-Val) which are a little smaller than the stock Aristo wheel, mine do not interfere at all. Reinstall the two small screws under the doors. On a reefer, reinsert the center step. The new floors aren't drilled to accept a reefer step so you will need to use a small drill to make a clearance hole. Installed the screw under the door before you drill the holes to align the car floor to the frame. If you clamp the frame down first with the long screws, you may distort it so that the floor at the car center is bowed. The ATSF car has the new lower Aristo floor. The B&O car has the original floor. The difference between these cars is obvious. 0.175" does make a visual difference. This is the new Aristo floor vs. my maximum lowering job of 0.25", another 0.075" beyond the Aristo floor. There is a slight difference between these cars, but it doesn't stand out nearly as much. I've shown you three ways to lower Aristo freight cars, each with their own advantages and disadvantages. 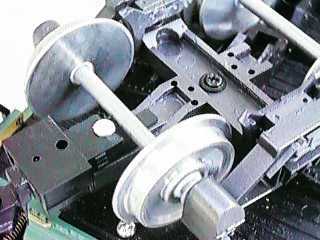 The first method requires a new bolster, but it is a little easier to do than the second method which reuses the existing bolster but requires more mill work. Both can lower the car up to 0.25" The third method is by far the easiest, but it requires that you buy a new floor from Aristo and you can't get the minimum overall height. The price for the new floor will vary depending on the dealer.